How much does it cost to attend your events and programs? The cost is FREE! 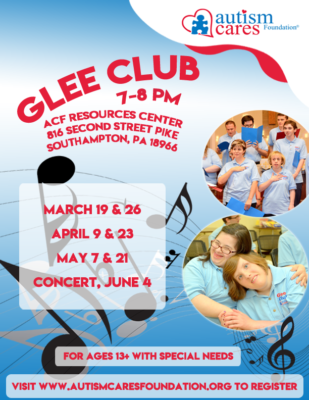 ACF has offered more than 1000 free programs and events to children, teens, and adults with special needs since its inception in 2008. Do you offer grants or funding? At this time, we do not offer any grants or funding. If you are looking for financial assistance, you can contact Autism Cares, a subsidiary of Autism Speaks at 1-888-288-4762. Ask for the Family Services Department. How can I join your mailing list? 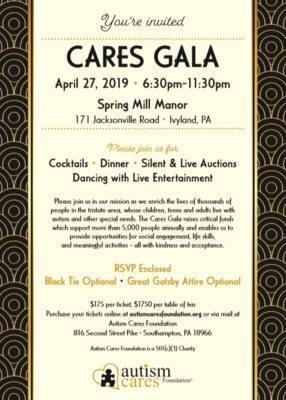 Simply send an email to events@autismcaresfoundation.org with your name and we will gladly add you to our events email list. How do I register for one of your programs or events? Visit our events calendar for a full list and to register for our upcoming events, programs and fundraisers. Who do you serve? We host 200 free programs and events each year for children, teens and adults with special needs, and their families. How do I access adult services in Pennsylvania? First contact your County’s Mental Health and Developmental Disabilities office. Provide them with documentation of diagnoses (Autism, Intellectual Disability), and set up a meeting to discuss supports coordination. Once assigned a supports coordinator, they will complete assessments to determine the level of need (PUNs). Once assigned a level of need (Planning, Critical, Emergency), they will generate an Individual Support Plan that will outline individual goals and what services are available. You are able to select which providers you would like to provide the service. How do I access adult services in New Jersey? How can I enroll in Autism Cares Foundation Adult Services Programs? Fill out an intake form by clicking here. We will then reach out to schedule a consultation meeting. What waivers do the Autism Cares Foundation Adult Services Programs accept? I see that you provide a day habilitation program. What do you do in this program? The Autism Cares Foundation Services Division provides an adult day habilitation program. This program uses evidenced based approaches and curricula to teach daily living skills, social skills, and self-help skills in a fun, structured, and supportive environment. Hours of operation are Monday-Friday 9am-3pm at 816 Second Street Pike Southampton, PA 18956. For more information, fill out an intake form on our Adult Services – Day Programs Page here.